Results of mathematical simulation of processes of plastic deformation, heating and cooling of steel plates during high-speed collision are presented. The method of hydrodynamics of smoothed particles is used to simulate the processes of plastic deformation and of the corresponding heating. The results of the simulation agree well with the experimental data and make it possible to explain the special features of structures observed in explosion-welded steel billets. Translated from Metallovedenie i Termicheskaya Obrabotka Metallov, No. 10, pp. 60 – 65, October, 2018. The study has been financed by a grant of the Russian Scientific Foundation (Project No. 17-72-10226). I. A. Bataev, “Structure of explosively welded materials: experimental study and numerical simulation,” Metal Working Mater. Sci., 77(4), 55 – 67, doi: https://doi.org/10.17212/1994-6309-2017-4-55-67. 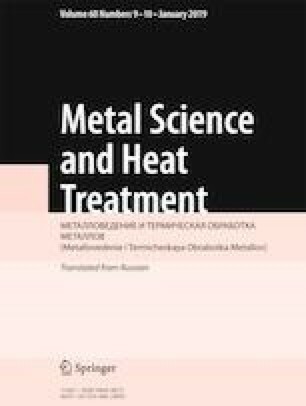 Q. Zhou, J. Feng, and P. Chen, “Numerical and experimental studies on the explosive welding of tungsten foil to copper,” Materials, 10(9) (2017), doi: https://doi.org/10.3390/ma10090984.